Reoperative surgery for failed previous medial or lateral epicondylitis surgery can be quite challenging. One key concern is making sure that other structures are not actually the cause of persistent symptoms. In the case of medial epicondylitis, it is important to assess for possible medial antebrachial cutaneous nerve (MABCN) injury, ulnar neuropathy, or medial collateral ligament damage. These can sometimes be a source of continued symptomatology despite expertly performed medial epicondylitis surgery. One of the newer techniques for addressing failed or recurrent medial epicondylitis is medial epicondyle denervation surgery. This chapter delves into the surgical detail of this procedure. Similarly, for lateral epicondylitis, it is important to rule out evidence of persistent radial tunnel syndrome, radial capitellar joint plica or synovial fistula, as well as any damage to the lateral collateral ligament. In cases of true failed lateral epicondylitis surgery, a lateral epicondyle denervation surgery can be performed. This can be helpful in the patient who has had multiple previous surgeries. The other issue in treating patients with these conditions is trying to set a reasonable level of expectations regarding outcomes. 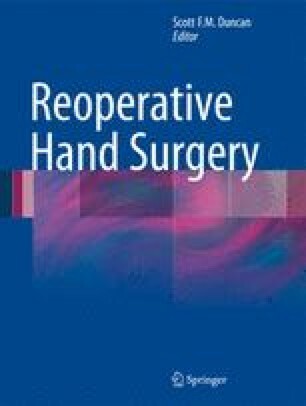 This chapter details some of the newer techniques for treating these challenging clinical problems.